Not practicing on Wednesday due to injury were linebacker Olivier Vernon (high ankle sprain) and linebacker Tae Davis (hamstring). Tight end Evan Engram (concussion) and linebacker Connor Barwin (knee) practiced. The New York Giants have signed linebacker Nate Stupar, who was cut by the New Orleans Saints on Monday. The 30-year old, 6’2”, 240-pound Stupar was originally drafted in the 7th round of the 2012 NFL Draft by the Oakland Raiders. Stupar has spent time with the Raiders (2012), Philadelphia Eagles (2012), San Francisco 49ers (2012–2013), Jacksonville Jaguars (2013), Atlanta Falcons (2014–2015), and Saints (2016–2017). He has played in 63 regular-season games with nine starts, six of which came in 2016 when he accrued 58 tackles. Stupar missed 11 games in 2017 with a torn ACL. Stupar is a solid reserve linebacker who excels on special teams. 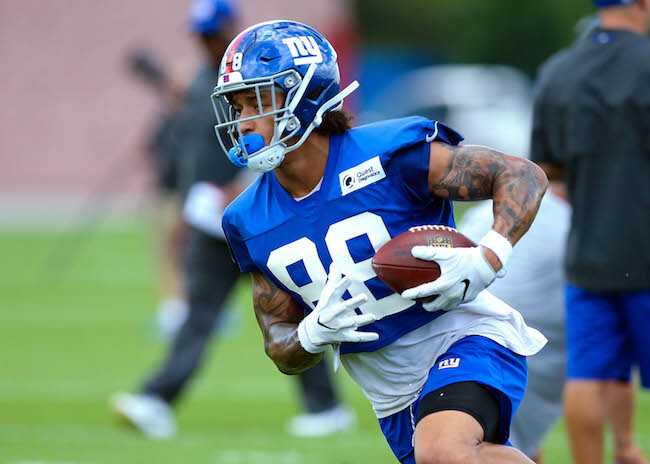 To make room for Stupar, the Giants have waived running back Robert Martin, who was signed as an undrafted rookie free agent after he impressed at the May 2018 rookie mini-camp as a tryout player. The Giants practice on Thursday and Friday in preparation for Sunday’s home opener against the Jacksonville Jaguars. The team’s coordinators will address the press on Thursday.